Japanese Proverb, “Hinsureba donsuru” “Hisashi o kashite omoya o torareru.”etc.. Here is some of popular proverbs people in Japan still use in daily conversations. If you know these proverbs, not only you can enjoy conversation but also you will be getting respect immediately. So, let’s learn Japanese Proverbs. Hotoke tsukutte tamashii irezu (irenu). An image of Buddha is made, but there is no soul in it. This is said of failure to put the finishing touch. The phrase, “manako o irenu” (no eyes are given to it) is sometimes substituted for “tamashii irezu (no soul put in it). There is an expression, of Chinese origin, “garyo- tensei” (completing the eyes of a painted dragon). A painted dragon minus the eyes suggests a lack of one thing needful. Another proverb of Chinese origin runs: One fails to get the credit of having completed an artificial hill of nine jin (one fin — about eight feet) for lack of one basketful of earth (Kyujin no ko o ikki ni kaku). Hyakubun wa ikken ni shikazu. Hyotan kara koma ga deru. Out of a gourd comes a pony. The hard-shelled fruit of a plant called bottle gourd are dried, varnished, and used as bottles for sake, rice wine. Such bottles, as well as the fruit themselves, are called hyotan in Japanese. This proverb is often quoted when a most unexpected thing happens, or when a truth comes out of what has been said in jest. “There’s many a true word said in jest.” Another “hyotan” proverb is: Hyotan namazu (It’s like trying to catch a namazu, or catfish, with a gourd). This is an expression meaning (1) “as slippery as an eel” and (2) vague, non-committal. I no naka no kawazu taikai o shirazu. The frog in the well knows no ocean. Ichi o kiite ju o shiru. To learn one and infer ten. A universal truism applicable to an intelligent person capable of inferring the whole from a part. Another proverbial expression beginning with ichi (one) is the equivalent of the English expression, “sink or swim,” or “win or lose;” namely, Ichi ka bachi ka, an expression presumably derived from gambling. (A syn­onymous expression: Noru ka soru ka, is used to the same effect.) Note that the Japanese phrases are expressed in rhyme, and the English phrase, “sink or swim,” in alliteration. Still another ichi proverb is: Ichiji ga banji (One thing is everything). The meaning is that this case will serve as a yardstick for all the rest. First a girl, then a boy. The word, hime, means a princess, a young lady of birth, and by extension, a daughter. Taro is a very common name given to a first-born son. Here in Japan “first a girl, then a boy” is considered the ideal order of children’s births in a family. Ichi-mon oshimi no hyaku shirazu. He who is stingy with one mon does not know the loss of 100 mon. Ichi-nen no kei wa gantan ni ari. A year’s plan is to be made on New Year’s Day. The Japanese people make much of the new year and celebrate it more elaborately than Western people. The Japanese people consider it to be a favorable omen to make their plan for the year on New Year’s Day. Iki-uma no me o nuku. To pluck out the eyes of a live horse. Life is the source of things. Inu mo arukeba bo ni ataru. Even a dog will come across a stick when he walks about. This popular iroha-card proverb is usually interpreted in two ways: (1) Misfortune will befall a mortal sooner or later; and (2) Fortune may visit one unexpectedly during life’s journey. Benham’s Book of Quotations has “Even the street-dog has his lucky days” as a Japanese proverb. Referring to the respective characteristics of dogs and cats is this saying, Inu wa hito ni tsuki, neko wa ie ni tsuku (The dog goes with the family; the cat remains at the house), said of the instinctive attitudes of these two domestic animals, at the time of the removal of their owner’s family to other quarters. Ishi no ue nimo sannen. Three years’ sitting even on a stone. This is one of the proverbs inculcating a cheerful endurance of the ills of life. Even a cold stone will get warm from being sat upon for a long time. Perseverance prevails, and patience may wear out a stone. “If money comes in slowly at first, do not be discour­aged; it is a long lane which has no turning.” —Lord Avebury. To cross a stone bridge by sounding it. Anybody who is cautious even to timidity is often described as the sort of person who makes it a rule to cross even a stone bridge only after sounding it. One cannot be too careful. Ishoku tarite reisetsu o shiru. When one has enough food and clothing, one comes to know what decorum is. I so gab a maw are. If you are in a hurry, make a detour. Issun no mushi nimo gobu no tamashii. Even an inch-long worm has a half-inch soul. An inch ahead is all darkness. Itsubo no arasoi wa gyofu no ri. 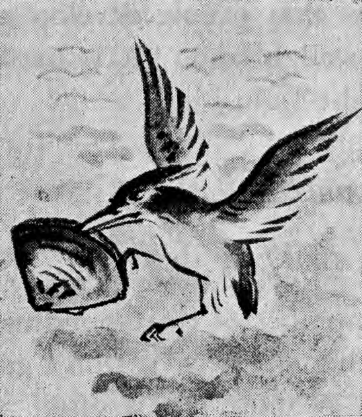 A fight between a snipe and a mussel benefits a fisherman. A clam and a snipe locked in a life-or-death battle. They are doomed to fall into the hands of a third party, a fisherman. “GADEN-INSUI’’ ’’GEI WA MI O TASUKERU’’ ETC..